After the Second World War, Polish Radio was the most significant employer of musicians, including composers, arrangers and performers. Its orchestras and vocal ensembles covered a wide range of music, from classical to folk and popular music. 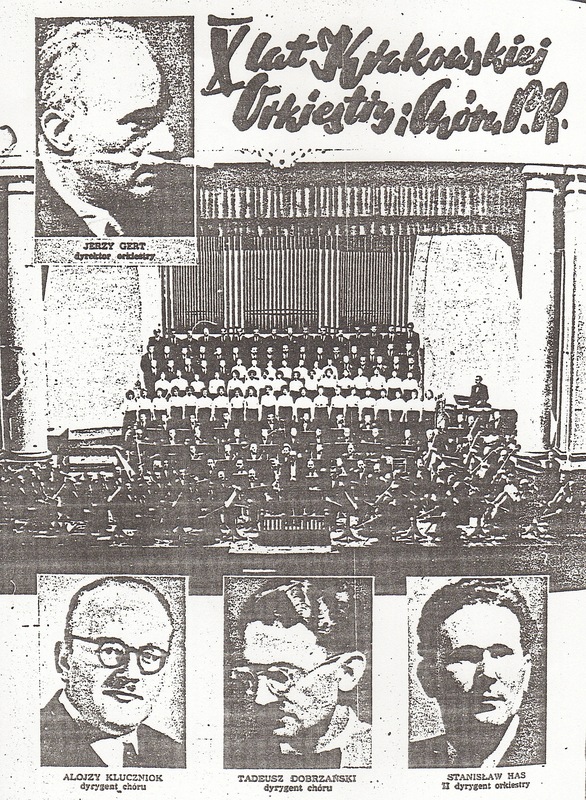 The principal performers of Lutosławski’s mass songs had been the Warsaw-based Polish Radio Choir and Orchestra, conducted by Jerzy Kołaczkowski. His soldiers’ songs of 1953 were recorded by the Polish Radio Dance Orchestra and ‘Czejanda’. Lutosławski’s popular songs between 1957 and 1963 were performed were performed by the Polish Radio Dance Orchestra, by many small ensembles, and by the Polish Radio Orchestra in Kraków. This orchestra celebrated its tenth anniversary in 1958. Between them, Jerzy Gert and Stanisław Has recorded eight of Lutosławski’s popular songs, all of them arranged by Tadeusz Dobrzański. Little is known at present about why or how Lutosławski set about writing his popular songs. What is known is that most of them were broadcast and recorded by Polish Radio and were published in PWM’s series Śpiewamy i Tańczymy. Almost a third of them were printed in Radio i Świat and its successor Radio i Telewizja. A few received commercial recordings. All of Lutosławski’s songs were performed and published under the pseudonym ‘Derwid’. The manuscripts of the first six songs, however, are headed by the name ‘Bardos’. Bardos is a character in a play (and opera) written at the time of the Kościuszko Uprising in 1794: Cud mniemany, czyli Krakowiacy i Górali (An Apparent Miracle, or Cracovians and Highlanders). Bardos is a wandering student who solves a dispute near Kraków by frightening off marauding highlanders with several ‘miracles’. The best of these is when he gives them an electric shock with a wire attached to his portable generator. Bardos also demonstrates a deep philosophical concern for the human condition – perhaps this appealed to Lutosławski. He changed his pseudonym, however, when he discovered that there was a living Hungarian composer called Bardoś. Derwid is very different. He is the central character in Juliusz Słowacki’s play Lilla Weneda (1840). 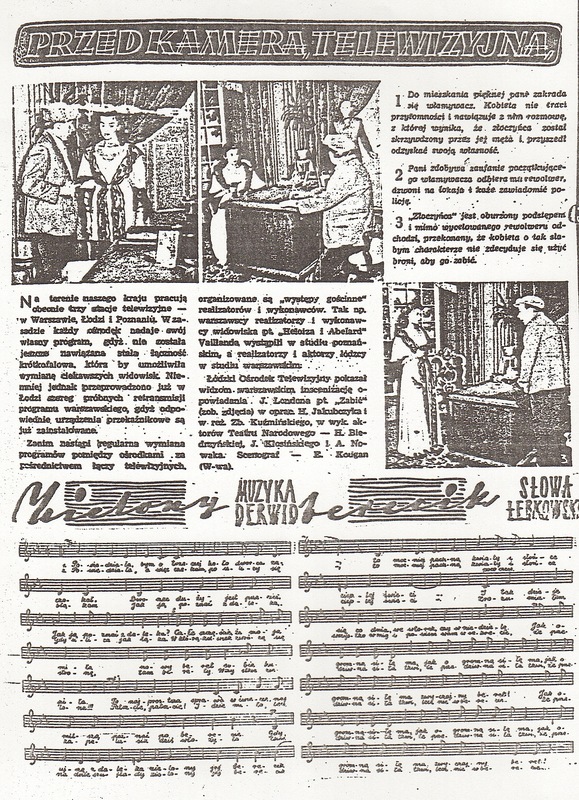 Lutosławski wrote music for a Polish production of Lilla Weneda in 1959, and his adoption of Derwid in 1957 may have some connection. Lilla Weneda is a tragedy about Poland’s mythical past and its more recent struggles for independence, such as those of 1794. The fated Derwid, King of the Wenedy, carries a symbolic golden harp whose “spirit will continue as long as I live”. On the surface, Lutosławski’s choice of Derwid may be seen as simply musical, but deeper reasons may also have provoked it. 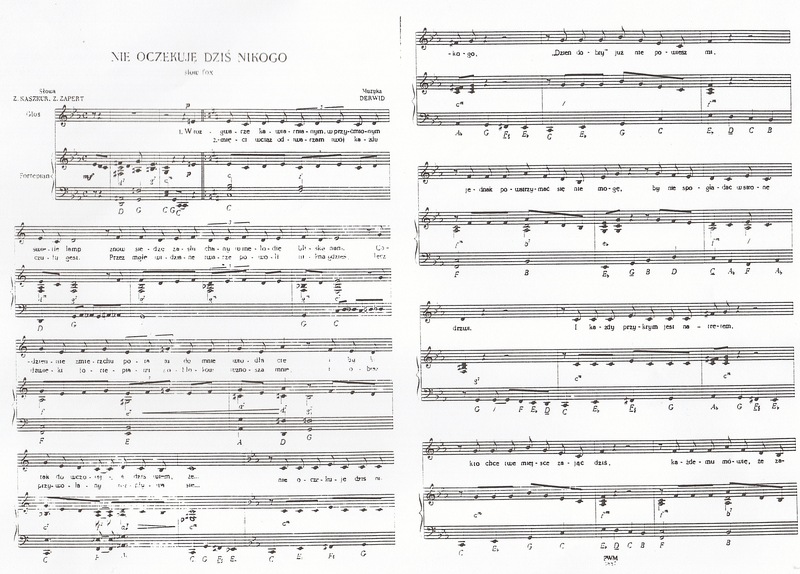 The first of Derwid’s songs to appear in print was the foxtrot Zielony berecik, in Śpiewamy i Tańczymy in May 1957 and subsequently in Radio i Świat in July. Its laid-back idiom and chordal shifts bear more than a passing resemblance to Gershwin’s Love Walked In (it is worth recalling the use of jazz in Lutosławski’s music for the radio play Prawda o Syrenach ten years earlier; see Panel 2). The prominence accorded songs in Radio i Świat varied in the late 1950s and early 1960s. By and large, they were buried in the magazine, notably among the listings in later years. In 1957, they could be found, as here, at the back among other radio profiles. 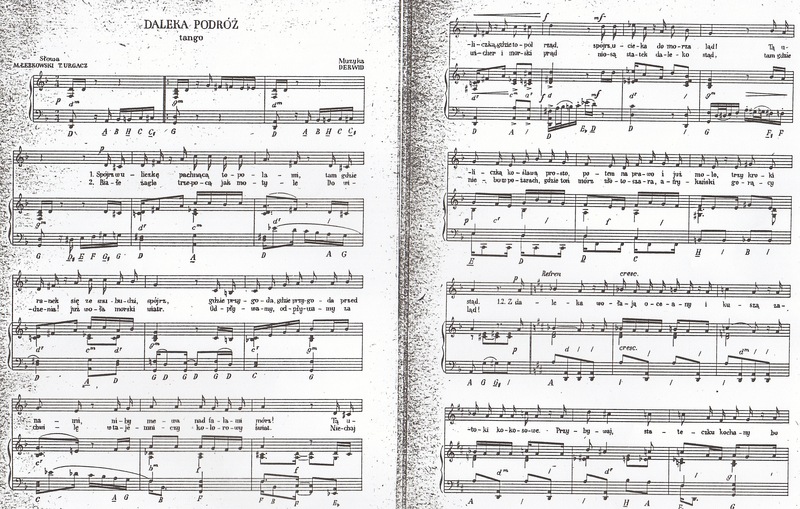 Daleka Podróż is also one of the early songs (1957) and on of the six written under Lutosławski’s first pseudonym, ‘Bardos’. It is one of the composer’s most accomplished, although all the songs show an empathy with their idioms and seem to have been written with some enjoyment, if the results are anything to go by. Daleka podróż is a tango in which the singer dreams of travel, waiting impatiently by the pier for the boat to Africa and fantasising about ocean waves and tempting coconut bays: “we will send greetings in our letters home from the land of palms and parrots, but we will not say anything to anyone about being homesick”. The slight sting in the tail gives the song a poignancy borne of the Poles’ continuing inability to travel abroad freely in the late 1950s. A nice musical touch at the start of the refrain of Daleka podróż, when the singer dreams of ocean waves, is the absorption into a fairly familiar harmonic shift in popular dance music of a theme from the third movement of Debussy’s La mer. When Radio i Świat requested listers’ reactions to broadcast mass songs in the 1950s, there appears to have been no publication of the responses. 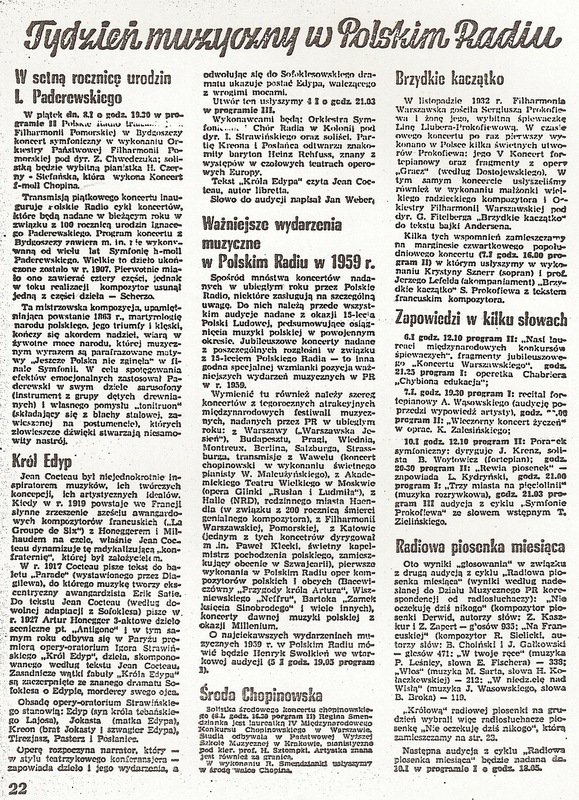 In late 1959, however, its successor Radio i Telewizja held listeners’ polls connected to its programme ‘Song of the Month’. Derwid’s songs appeared in these polls on a handful of occasions, coming top just once. The result was announced in the first issue of 1960: Derwid’s slow-fox Nie oczekuję dziś nikogo gained 935 votes, with four other songs some way behind.